IF YOU HAVE A CAR, DRIVE HOME! When I consider how I am buoyed by the smiles and laughter of my grandson and how I learn so many lessons from him, I feel sadness for this woman Lucy since obviously she hasn’t taken the time to invest in her grandchildren to discover that in the end you are the one who gains. Anyways, today is Wednesday and I have my grandson for another morning of activities. We have begun a new theme exploring various fairy tales. We watched a movie about Goldilocks and the Three Bears that had a different twist to the ending and then we read two books of the same fairy tale. 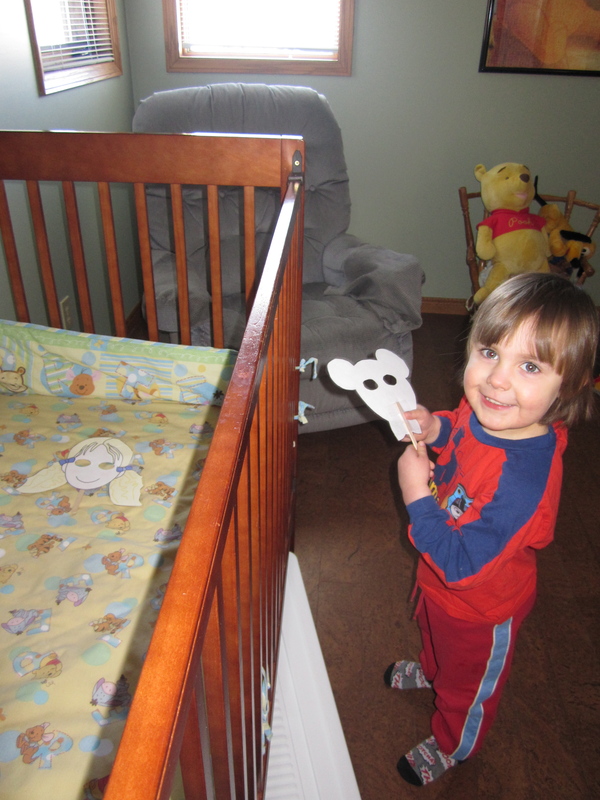 He and I had fun acting out the story as I played Goldilocks and he played all three bears! Interestingly, he didn’t want to be Goldilocks and I wonder if it is because the character was female! Or perhaps, he thought he had enough responsibility acting out three parts! 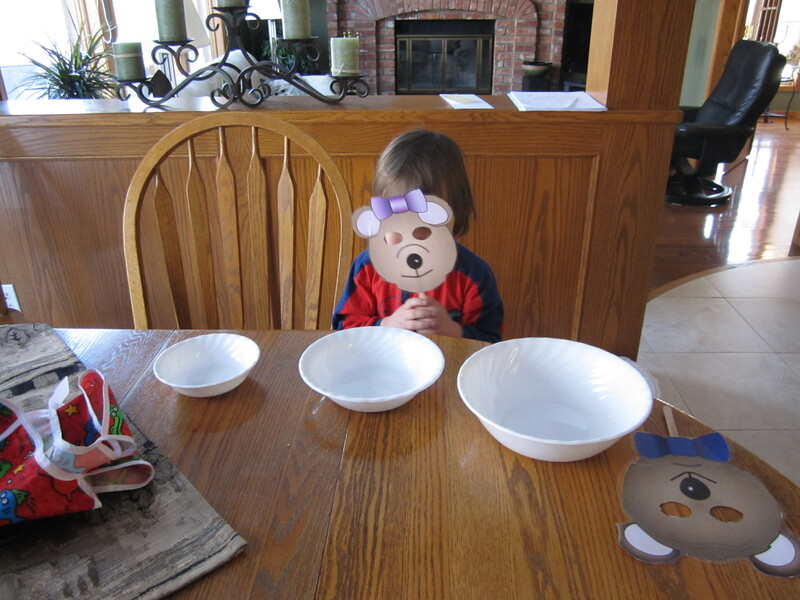 Anyways, we placed three different sizes of bowls on the table to begin our story. Then we found 3 different chairs and 3 different beds to continue our story. As Jackson acted out his three roles, he placed the appropriate mask to his face. I really should have filmed our story to capture his gruff Papa Bear’s voice saying, “Someone’s been sleeping in my bed.” Or perhaps his Baby Bear’s voice was even more enjoyable as he said, quite indignantly, “Someone is in my bed.” We had left Goldilock’s mask sleeping in his own bed so maybe he wasn’t really acting!!! 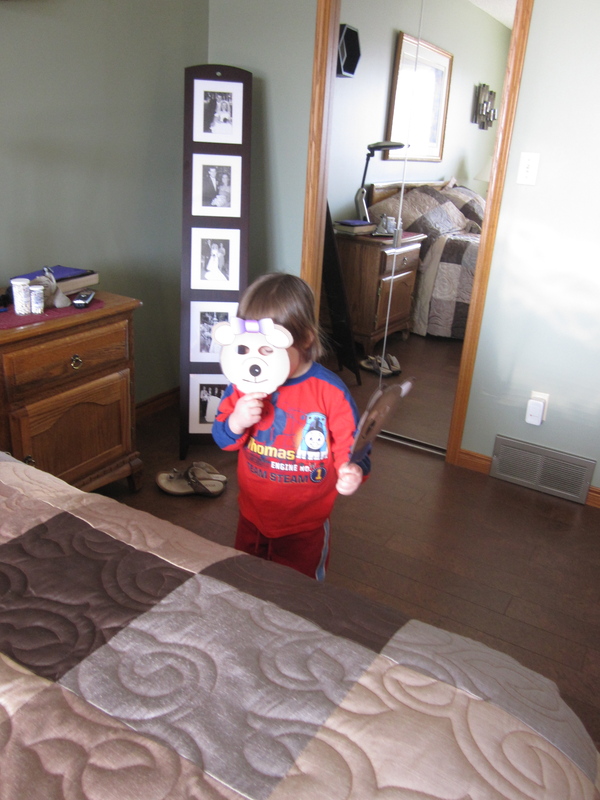 He got quite a chuckle when I took Goldilock’s mask and put her by the bedroom window as he explained how she ran away from the bears. What fun! 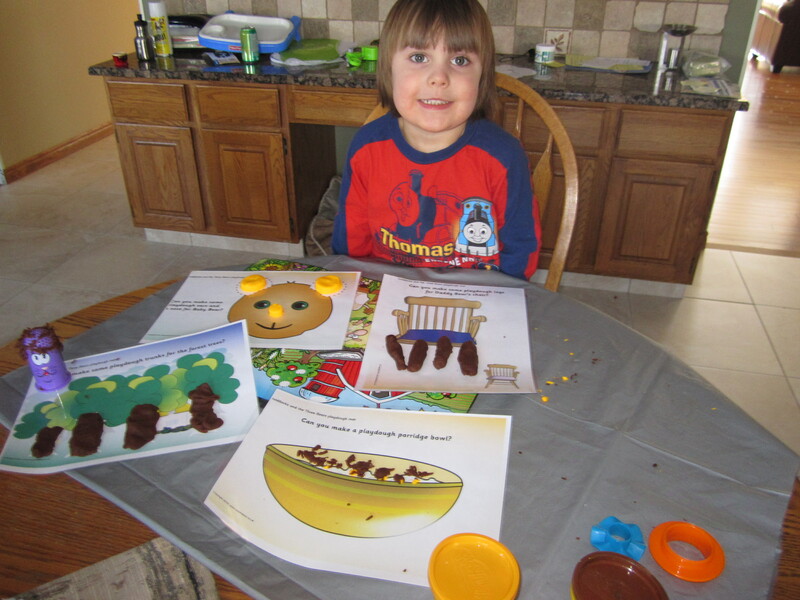 We spent quite a bit of time playing with playdoh as I found some playmats to print from the internet where he had to complete the picture making legs for Papa Bear’s chair, trunks for the trees in the woods, and ears and nose for Baby Bear. We also got distracted playing with a PlayDoh head that has lots of holes in its head. You push the Play Doh up through the character’s head to watch his hair grow. Using PlayDoh scissors, I’m not sure how many times Jackson gave this character a hair cut! Later, I put a blanket over my coffee table and told Jackson to crawl under the table since we are pretending this is the bear’s den. 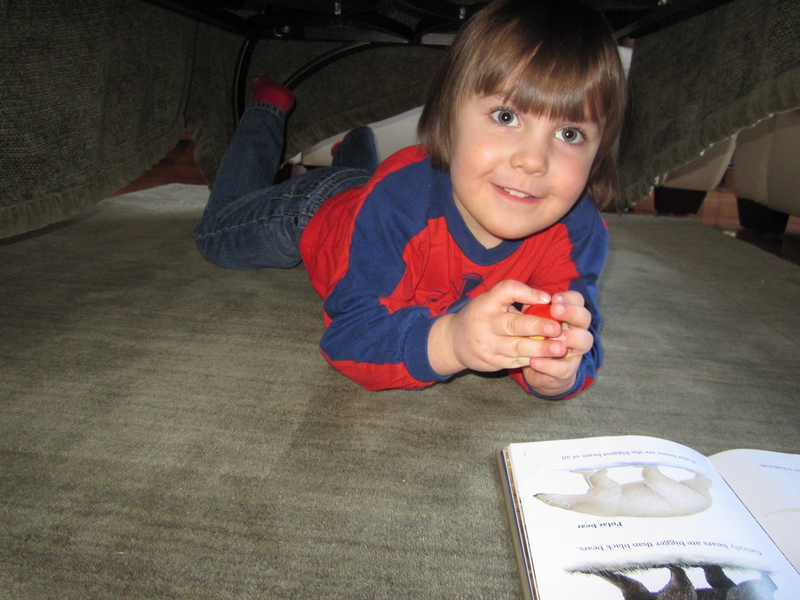 I wish I could have captured the expression on his face when we both lay on our tummies under the table as I read him a book about bears. To conclude our activities regarding Goldilocks and the Three Bears he told me the story as he put the pictures on the flannelgraph. 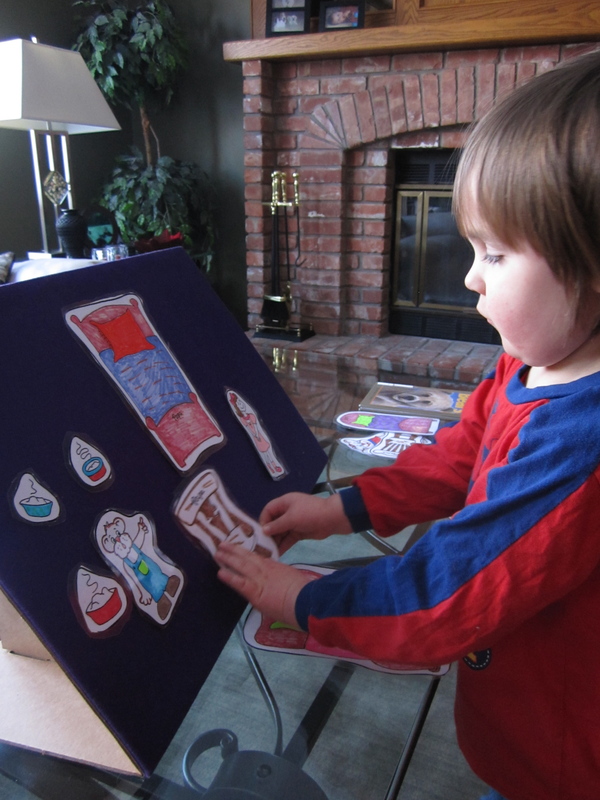 I am hoping this photo captures his full concentration as he organizes the pictures on the board. We proceeded to read from The Preschool Bible about Jesus telling Peter to cast a net into the water and how Peter caught a net full of fish. As usual Jackson is always ready to pretend as I said we had to go downstairs to find our boat and go fishing. I gave him a netted laundry bag and told him that is how we are going to catch fish. I explained how they cast nets into the water to catch fish rather than using fishing rods. We got into our boat which was a bath towel placed on the floor. I had already placed some paper fish on the floor that he “caught” using his net. He got inspired and jumped out of the boat to find two instruments. Back in the boat, he gave me an instrument and one for him as I taught him the song, “I will be fishers of men . . If you follow me.” We walked upstairs as if in a parade and marched through the house singing and playing our instruments! 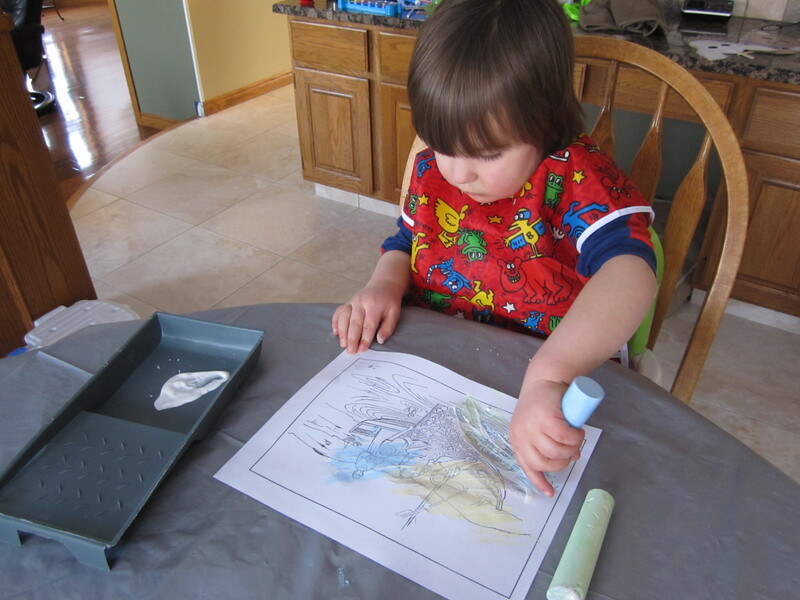 We finished by doing two different crafts – one of fish in a bowl and the other painting a coloring page of this Bible story by dipping chalk into white paint. When we were eating lunch, the doorbell rang. He was hoping it was his Grandpa. I told Jackson that Grandpa couldn’t come home today – that he was at work. He simply replied, “Grandpa has a car to drive home.” A simple solution! I like the way he thinks as he passes on another philosophical gem: You don’t have to stay at work if you have a car to drive home! Another gem. What a lucky little boy he is to have the Grandma he has.